I have to admit that I did not attend one of the many “tea” parties being held across the nation. Oh, I certainly agree with the main contentions, that our present tax system is not only absurd but allows government to act in a very reckless manner. While liberals and democrats might consider this mere whining at the moment, since the government is firmly in their hands, they might do well to consider how they felt when the other side ran things not so long ago, and both liberals and conservatives, democrats and republicans alike might do well to consider how seldom government is really accountable and responsible in its conduct. Should we accept threats from individuals elected to represent the people, who now do as they please with the warning that if we get in their way, things might get nasty? Is our best hope merely that we do not end up with ‘someone worse’, which has been the sub rosa message from both parties for quite a while now. The TEA is supposed to mean ‘Taxed Enough Already’, but for many of us I believe the real message was ‘Tricked Enough Already’, maybe taunted, maybe we should say our politicians are ‘Tainted Enough Already’. We are all of us sick of the hypocrisy, the blatant lies and backroom deals. Don’t tell me only party ‘x’ does this, we’ve seen it across the board for most of our lives. I do believe the republicans do this less often than the democrats, but that hardly means it’s something to tolerate, much less encourage, just because “our side” is doing it. I admire and respect George W. Bush because, mistakes and all, we had an honest man in the office. Democrats claim the same thing about Barack Obama (while denying it about Bush), which I do not see, but at least we can agree that what we seek is transparency and integrity. Once we start looking at Congress, it gets difficult to find integrity. It’s there all right with some members of the House and Senate, but it’s clearly an endangered species on the Hill. And that brings us back to the Tea Parties. Whether or not you think the programs included in the Stimulus and the bailouts were good or not, the plain fact is we citizens were steamrolled by them; no one really asked the people what we thought or were willing to pay for. Now, trillions of dollars have been committed to things that, good or not, do not really do a single thing to help folks save their homes, help banks offer loans more freely, or save jobs at major companies. The plans were nothing more, in practice, than politicians using crisis to advance their personal ambition and help their buddies. And that fact should really make you angry. You’ve been lied to and robbed, and only a great fool would pretend otherwise. That’s what the protests were all about. So why didn’t I join in? First off, I’m not one to waste time on spilled milk. That money is spent, its not coming back, and history tells me that there are better ways to work for effective change than hold a rally and make noise that the politicians will either ignore or pretend is aimed at someone else. Second, it will sound cynical to say so, but there are a great many fools in the world today, willing to fall for a shiny promise or a scary story. The only way to change things is to educate people, and that is a one-on-one thing, and it takes time, patience, and a willing student. Frankly, a lot of folks are not ready for that lesson. And third, the bad thing about these protests is that folks do them and then go home and think they’ve done something, that they can get back to normal. You can win football games that way, but you cannot change the nation that way. This is a long fight, and we’d better be ready for what it takes to win, because right now the other side has a powerful system and a lot of force at its disposal. How many politicians are serious about tax reform? How many Senators really grasp what it means to balance raising your family, paying for your home, your kids’ college, and still saving something significant for your retirement, in an environment where ‘job security’ is fiction, where ‘financial planning’ is a faraway ideal, and where ‘accountable government’ is an oxymoron. My country, my money, my rights. I will defend them because I want them to be around for my children. What about you? 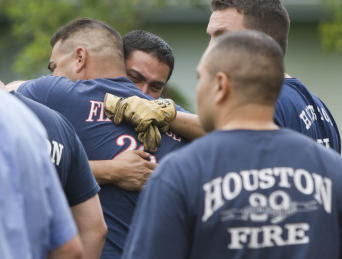 12:03 AM, Easter Sunday, Southeast Houston – The 911 call was like many that came before it and which would follow; a simple but dangerous house fire. Station 26 dispatched two trucks, as normal. 12:07 AM – A four-minute trip and the firemen arrive at a single-story brick home at Oak Vista and De Leon streets, among them Captain James Harlow and rookie firefighter Damion Hobbs, recently returned to the US from serving a tour in Iraq with the US Army. 12:15 AM - As firefighters battled the blaze, the flames subsided quickly and it appeared the fight would be an easy one. Captain Harlow, speaking with neighbors, learns that two elderly people live in the house and were not seen to leave, so he and some other firefighters enter the still-burning house to search for them. 12:25 AM – Winds suddenly become much stronger, and the flames revive, bursting through the roof and moving quickly across the frame. Witnesses later said the flames shot up as high as 50 feet. Because of the intense heat and unpredictable behavior, firefighters are ordered to fall back. As they emerge from the house, the firemen are counted. 12:30 AM – A second roll call confirms that Captain Harlow and Probationary Firefighter Hobbs are still in the house. The flames remain too intense and the winds too high for firefighters to re-enter the home to search for their comrades. The couple who live in the house are found safe outside, having escaped before the fire department arrived. They did not know that firemen had been looking for them. 1:10 AM – Firefighters are finally able to enter the home and search for the missing men. 1:20 AM – The bodies of James Harlow and Damion Hobbs are found and brought outside. CPR is attempted on the lawn, but is fruitless. Firemen form a ‘wall of honor’ as the bodies are carried to ambulances. 2:00 AM – Mayor Bill White arrives and speaks to firemen. The crew of Station 26 finishes clean-up of the area and works out the rst of their shift without incident. You may notice the word ‘hero’ used a lot in various ways. It’s often used by politicians and media people to describe celebrities and sports figures. I submit that the word should be reserved for someone who daily puts everything on the line in order to make a difference for others. Medals and honors may be awarded for all sorts of actions, but there are few true heroes. Sadly, many real heroes are distinguished by the cost of their valor. A neighbor at the scene of the fire sadly observed that she never thought the firemen could be in danger, she said everyone ”sort of thought they were invincible … we never imagined this could happen”. Captain Harlow served nearly three decades as a fireman, and Firefighter Hobbs served his country in war before completing his fire academy training to serve his community in this most demanding vocation. These are true heroes, against whose example few men can measure. May God grant their families peace and comfort for their loss, and indeed we are poorer for having lost such men, though richer to have been blessed that such men would give their best talent and devotion to service.